Owned and operated by Coach Audrey Erlandson, multiple Ironman Finisher, Ironman Certified and NCCP TriBC multisport endurance coach and athlete, based in the beautiful resort community of Whistler, BC, providing athletes of all ages and abilities the opportunity to fulfill their dreams of completing their first endurance event, achieve personal fitness goals and live a full life of fitness, fun, and adventure! Competing in Triathlon was something I thought I could never achieve. After crossing the finish line of my first sprint distance race, I was hooked on the triathlon lifestyle that focused on “sport for life”. I met so many amazing people from all over the world and developed life long friendships, and traveled to race in places I never imagined I would. Since 2003, I have competed in 12 Ironman races, represented Canada 3x at the ITU Triathlon Age Group Worlds, and I compete regularly in all distances of triathlon events including mountain biking, road cycling, trail running, and adventure racing. 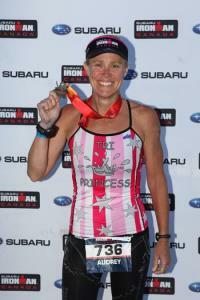 My journey has not been easy, and I have had my share of “life’s obstacles” (surgeries, bike crashes, health issues). Throwing in the towel and giving up on the endurance lifestyle was not an option and I continued to persevere through all the ups and downs. It was through sharing my stories with others that I realized how much I was inspiring others to try something they too also thought they would never do. This gave me the biggest joy in my training and racing journey and it was then that I decided to become a triathlon coach in 2009. The greatest gift I receive everyday is seeing my athletes accomplish goals they never thought possible. Whether it is simply hiking to the highest mountaintop, swimming open water for the first time, riding a road bike for the first time, or taking their newfound fitness to explore places in the world they never imagined possible. Success. Coach Audrey Erlandson has been notified of your message.